Bangers are booming across wine country in a futile attempt to dissuade hungry birds that flock overhead looking for a free juicy meal below in the vineyards. It means the grapes in Niagara are ripening, fall is rapidly approaching and vineyard crews are gathering to pick the first of the harvest, generally reserved for the Pinot Noir and Chardonnay that’s used in the region’s sparkling wines. Wineries are about a week a way from bringing in the first sparkling grapes of the 2011 vintage, a year that has seen intense spring rain, record heat in July and a mixed bag of everything imaginable in August. The quality of the vintage has yet to be determined, as what matters most is the weather between now and Halloween. Wineries are bracing for one last summer crush of people as we approach that last long weekend of the season before kids head back to school. It’s a great time to come out to wine country, enjoy the new releases and, yes, stock up on some robust reds for the fall and winter seasons that are now on our doorstep. Henry of Pelham Baco Noir Reserve 2009 ($25, winery, Vintages on Saturday, 90 points) – Baco Noir in the hands of the right winemaker and grown in the right vineyards, is such a wonderful and different grape that can be crafted into a flavourful and untamed wine. The nose reveals the beauty of this grape from the outset — aromas of wild berries, currants, bramble/underbrush, BBQ smoke and earthy tones all come together beautifully. The jammy, dark fruits are intense on the palate with touches of raspberry on the edges to go with balancing acidity and spices. Angels Gate Sauvignon Blanc-Semillon 2010 ($15, winery only, 88 points) – These traditional white grapes of Bordeaux are blended together here with some barrel aging in oak for added texture, complexity and flavour. The nose shows creamy vanilla, pear, citrus, melon and spice. It has bite on the palate with oak, pear, tropical fruits and spice in a fleshy-juicy style. Angels Gate Rose 2010 ($12, winery only, 86 points) – A Gamay dominated rose with a bit of Pinot Noir and Cabernet Franc added in. The nose shows cherry and strawberry notes. It’s a soft, round rose with meaty red fruits on the palate. Angels Gate Mountainview Gewurztraminer 2010 ($17, winery only, 89 points) – This is Angels Gate’s first “reserve” Gewurztraminer and it’s an excellent start. A nose of musk, rose petals, grapefruit and clove spice. It caresses the palate with broad fruit flavours and lovely spice integration. Some vibrancy on the palate, but essentially a wine with medium acid and oodles of flavour and spice. 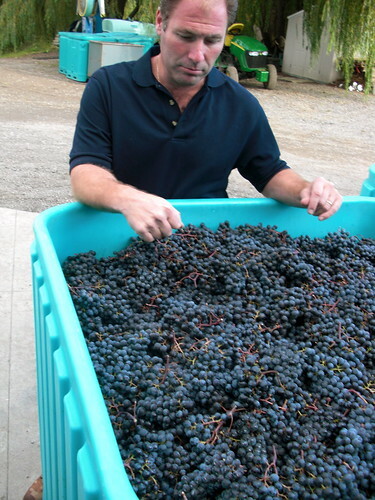 Winemaker Brian Schmidt of Vineland Estates with the 2010 Pinot Meunier harvest. Vineland Estates Pinot Meunier 2010 ($18, winery, 88 points) — Very few in Niagara are growing this wonderful grape, a cousin of Pinot Noir, and more commonly known as the third grape used in making French Champagne (Chardonnay and Pinot Noir are the other two). Winemaker Brian Schmidt is a believer in Meunier’s potential in Niagara. The 2010 bottling, the second vintage of this wine (see photo above of it being harvest last fall above), has a beautiful nose of raspberries, smoke and blueberry. It’s quite juicy on the palate and not over-powered by oak. It’s a lush and delicious wine. Vineland Estates Brut Reserve 2008 ($23, winery, 88 points) – A nose of toast, citrus and apple with a mousse that’s tight and lively. Notes of tangerine, citrus and toasted vanilla notes in the mouth. It’s a blend of Pinot Meunier and Pinot Blanc. Calamus Unoaked Chardonnay 2010 ($14, winery, 91 points) – Yes, as you can tell by the score, I loved this wine not only because it tastes fantastic but also because it’s only $14. The nose is fabulous with pronounced tropical fruits, green apples and peaches. It’s lush on the palate, with a touch of sweetness that’s more about ripe fruit than residual sugar, with clean fruit through the finish. What Chardonnay without the oak should taste like. Calamus Pinot Gris 2010 ($17, winery, 88 points) – A pretty and fragrant nose of melon and baked apple crisp. The fruit is bright and full on the palate with ripe tropical, melon and apple flavours. Lip-smacking good! 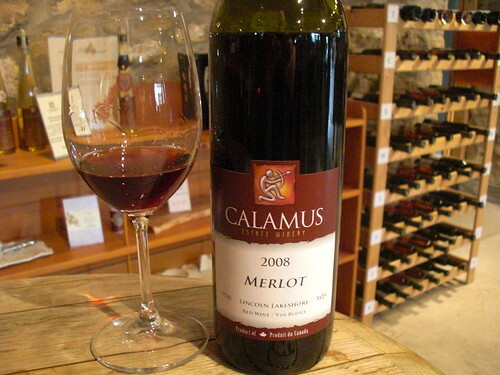 Calamus Merlot 2008 ($25, winery, only 70 cases released on Sept. 24, 91 points) – This is the first single-variety Merlot Calamus has made and it’s a beauty. It possesses a nose that just won’t quit. Cassis, blackberry, subtle red fruits, clove-vanilla, and other lovely spices neatly stitched in. It’s gorgeous in the mouth with oak that doesn’t hammer you over the head, medium weight, plenty of acidity and wonderful fruit intensity. A lovely cool-climate Merlot that’s designed with the dinner table in mind. Calamus Cosmic Red 2008 ($18, winery now, Vintages on Nov. 26, 87 points) – Made from traditional red Bordeaux grapes with cherries, currants, blackberries and spice on the nose. Good fruit in the mouth and decent structure. A pleasant companion for your favourite red meat. VQA police order Calamus to remove Bordeaux from back label — two years after bottling! Really.